Awesome pictures, stickers, stories, facts and more for all you fantasy fans. 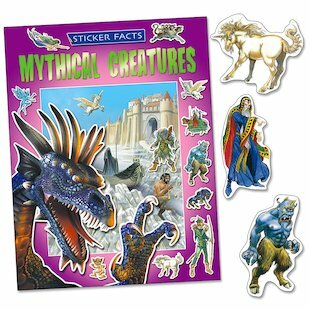 Meet unicorns, dragons, shape shifters, ogres, vampires, krakens and other magical creatures in this unique sticker book. It’s got creatures from myths originating all over the world, including Greek legends, European folklore, fairy tales and scary movies. You thought they only existed in legend – but now they’re loose, and stuck on everything!